Floating widget is nothing but the view that is drawn over other applications. Android system allows applications to draw over other application if the application has android.permission.SYSTEM_ALERT_WINDOW permission. We are going to use the background service to add the floating widget into the view hierarchy of the current screen. So, this floating view is always on top of application windows. To drag the view across the screen we are going to override OnTouchListener() to listen to drag events and change the position of the view has in the screen. 1. Create a new project in Android Studio from File ⇒ New Project and fill all the necessary details. 2. Download this resource drawables and add them to project’s res directory. This folder contains all the necessary icons & images required for this app. 3. Add android.permission.SYSTEM_ALERT_WINDOW permission to the AndroidManifest.xml file. This permission allows an app to create windows, shown on top of all other apps. We’ll also add a service named FloatingViewService that will be created shortly. 4. Create a new layout file named layout_floating_widget.xml for the floating view. This layout will contain two main views. The floating widget will remain collapsed when the view is launched. When the user clicks on this view, an expanded view will open. This view will contain buttons to play music, change the song to next/previous and open the application. Now create a service called FloatingViewService.java. Whenever you want to display a floating view, start the service using startService() command. In onCreate() of the service, we will add the layout of the floating view at the top-left corner of the window. Also, we are implementing OnClickListner() for all the buttons like play, pause, and open application. You can implement a function to play pause music on button click using MediaPlayer. When the user clicks on the close button in the collapsed view, FloatingViewService will get destroyed and floating view will be removed from the view hierarchy. Add the below code to FloatingViewService.java in onCrate() method. To drag the floating view along with the user’s touch, we have to override OnTouchListener(). Whenever the user touches the root of the view, we will record the initial x and y coordinates, and when the user moves the finger, the application will calculate the new X and Y coordinate and move the float view. Now one final step is remaining is adding floating view by starting the FloatingViewService. For that, we need to check if the application has android.permission.SYSTEM_ALERT_WINDOW permission or not? For android version <= API22, this permission is granted by default. 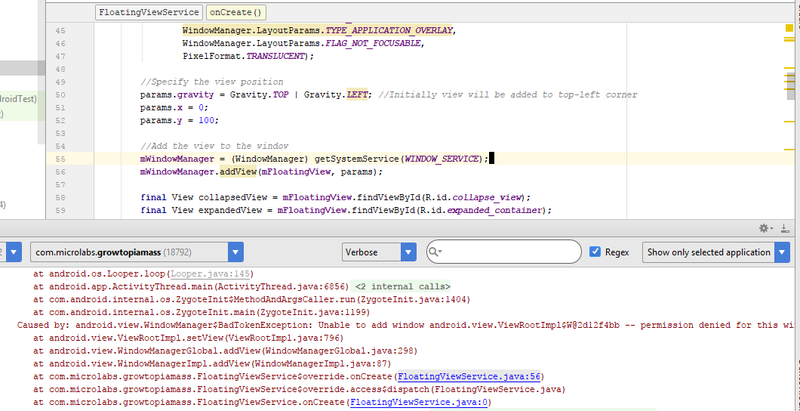 But for the android versions running API > 22, we need to check for the permission runtime. If the permission is not available, we will open permission management screen to allow the user to grant permission using Settings.ACTION_MANAGE_OVERLAY_PERMISSION intent action. This will open below screen facilitate user to grant android.permission.SYSTEM_ALERT_WINDOW permission. Here is the code snippet for the MainActivity that will display the floating view when button is clicked by checking the SYSTEM_ALERT_WINDOW permission. That’s it. Now build and run the project to see the results. You can check out the below image to see the sample in action. Don’t worry if you have any problems while building the project. If you have any queries let me know in comments below. I am an Android Developer and Machine Learner, based on Ahmedabad. I love to writing complex articles on android. I have a passion for building new things by continuously learning new things. Wow! Thank you once more for this great tutorial! Yup! Cool article. Thanks to Keval Patel. Thanks Kunal for your suggestion. It takes time as I am working on other articles. Thank a lot Keval for this tutorial. Very easy and understandable code. Thanks so much, It’s really wolderful. Where is the id notify_me? notify_me is id of button in contain_main.xml file.I suggest you to download whole project from above its better for u. Its there at the beginning of the article. How i can show two icon? Ravi Tamada for this great tutorial. Hey, i want show a multiple icon, How i can do it? Plz bro kya aap music player activity bana sakte ho jo json se data collect krta ho? aur notification player aur minimize krte hi neeche aur activities py b player neeche rehta ho with art image? audio url se play krta ho? Hi. Thank you for this great tutorial. I wonder can we have an EditText inside expanded layout? hello sir.. thanks for this tutorial. Its really helpful,but what i need is.. like i want to display my app in sticky mode only when user opens whatsapp or messenger app.just like hike does.. so can you please tell me how to do so.. I am not able to find the link for whole project Can you please give me the link..
Nice working code but the widget disappears when I remove the app for background even after providing the required permission! Really great tutorial & easy and clean code for implement this tutorial. Can we use the same implementation inside the application itself? means chathead should not come out from the application. sir first of all i would like to thanks you for all your tutorials i always learn something new here. this code work very fine but after starting service back button press not working in api 23 marshmallow please suggest some solution . Hlo sir can you please tell how to make the view go full screen ? Thanks for the awesome article !! Whether I can detect press a key like as volume up, volume down, ok on the service? and if can, how to handle it. Thanks! There is any idea to create a floating button which will be overlay only home screen? hey there; i’ve developed something similar but when app is on, my back button wont work and also i cant get keyboard for other apps when this app is on. ive used this to add view to window. I had written this code a few days ago to tackle the issues with both pre and post API 26 devices. Please feel free to use this code. 🙂 Let me know if you’re facing any issues. * Provides the default layout parameters for the Float Head. Very nice tutorial. I want the widget to be active even if the app is removed from ‘recent apps’. I have seen this in a few apps I use. How can we achieve this? I tried calling startForeground, return START_STICKY from onStartCommand and override onTaskRemoved and write some code in it. Nothing seems to work. Any help would be appreciated. we are in the same boat. Have you managed to find solution ? Hello! Copy/paste function appears when text is selected? The above line gives me an error in Android Studio. Service is highlighted in red colour. The problem occurs while the screen locked, the floating-icon disappears when the screen goes off. How to resolve this problem? @disqus_KxHzkEj50f:disqus @ravi8x:disqus getting the same error as above on motog5 as well. How to resolve?? I really need some help here… please. I am using this, and it is working like a charm, but I added in an EditText view into the layout, and when the whole thing is expanded, and I click into the EditText view, the cursor shows up in there, but the keyboard will not show up, so I can’t type in there. Is there any way to make it so when you click in the EditText view the keyboard shows up? Please help, I am so close to where I need to be on this. Thank you so much. studio. I downloaded your code and copied your in my project. When I run this on my device it is not showing any error but also not creating floating widget as well. When I click on button “Create Floating Widget” it executing Finish (); statement but not FloatingViewService.java. CAN I GET SOME HELP FOR THIS PROBLEM PLEASE!!! @ravi8x:disqus can you continue this tutorial a little further and show how the buttons are connected to the app to follow certain actions like play, pause, stop, etc? Is it possible to add a live camera in the widget? i want to ask something. Is it possible to make a simple widget and show data from my API ? i hope you give me respond, thanks! It’s possible. You need to make the network from the same service and update the widget. Are store the data in pref / db and update the widget. When I stay locked, when it comes to chat head, but when the phone is unlocked, the chat head will be hidden, how to do it? i have error at notify_me i don’t what is this …….